6 garlic cloves, minced- we love garlic, so use less if you donâ€™t! You may also add 1 tsp of Olive Oil, but we did not. You will also need: a spiralizer (we used a plain peeler because our spiralizer wasnâ€™t working--I donâ€™t suggest this for the sake of time). Combine tomatoes, basil, 2 garlic cloves, soaked sun dried tomatoes, with Â½ cup of the soaking water in the bowl of your food processor (we used the Vitamix instead). (If you are making a completely raw dish, put all of your garlic in here. Also, marinate the sliced mushrooms and diced onions in olive oil with a couple tablespoons of tamari. Let marinate for at least 20 minutes and put this marinade in the dehydrator, if you have one, at 115 until the rest of the dinner is ready). Process the tomato mixture until blended depending on your chunky/smooth sauce preference. Remove bowl from machine and stir in chopped walnuts- blend only until walnuts become chopped pieces. (Skip this step if making a raw dish) In a large skillet, heat a couple tablespoons of grape seed or coconut oil. Lightly sautee the onion and the rest of the garlic. Then add in the mushrooms. While the above is on the stove, make the pasta: cut zucchini in half vertically and use spiral slicer to make long strands. If you donâ€™t have a spiral slicer, you can shred with a food processor or hand held grater. When the onion, garlic, and mushrooms are done, pour the blended sauce mixture into pan to warm. 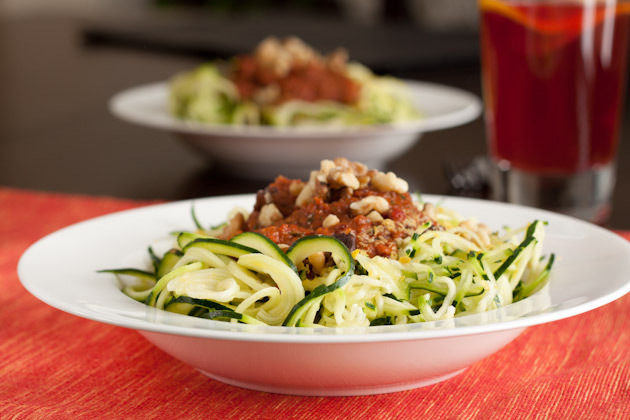 Also warm zucchini noodles by warming them in a separate pan. Enjoy! This is delicious with a glass of red wine or even a delicious beet ginger juice for cleansers!